Cathy Stephens was born not breathing. And since that day 47 years ago, breathing has periodically been a struggle for her. By the time she was a toddler, Cathy was diagnosed with severe asthma. But that didn’t stop her from being very, very active! However, asthma has affected Cathy’s choice of sports. As a child she always had to choose sports, such as softball, that are not high impact. She had to avoid basketball, soccer and other sports that involve continuous running. “I remember learning to ride a bike when I was four,” Cathy recalls. “I thought it was the greatest thing in the world." She started riding longer distances as a teen. Cathy also swims, which is also a low-impact sport for people with asthma. When Cathy was a teen, she started thinking about doing a triathlon. A triathlon is a competition where athletes complete a long swim, a long bicycle ride and a long run. All three are done on the same day, one right after the other. Cathy’s thoughts about triathlons started when she saw what used to be the “big” triathlon in Coeur d’Alene, Idaho, where she lived. She thought it was an amazing thing, and wanted to figure out how to do it. Cathy started with a “sprint triathlon,” which is a shorter-distance triathlon. Then she built up to Olympic distance. Then she learned about the Ironman Triathlon competitions. For the Ironman, athletes complete a 2.4 mile swim, 112 mile bicycle ride and 26.2 mile run. Assuming the Ironman would be beyond her abilities, she set her sights on the Half Ironman. 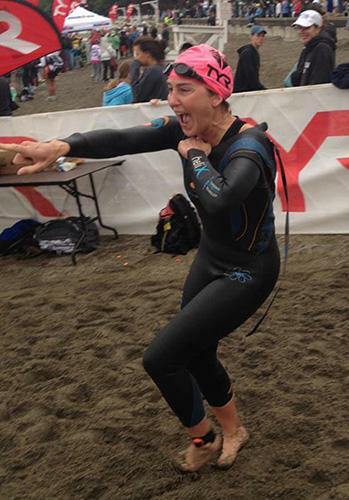 After training hard for a long time, Cathy successfully completed a Half Ironman competition in Boise, Idaho. Although she was always one of the last to finish in races and training, Cathy felt that it was a victory to finish at all. Cathy trained for the Ironman competition for a full year. Then, five days before the race, she got ill.
Cathy has a few triggers that set off her asthma. Her biggest trigger is sinus infections. Pollen, smoke and poor air quality are also triggers. When her asthma flares, Cathy is often quite ill for about 10 days. Cathy remembered the many times she had laid in the hospital thinking, “If my body could, what would I do?” On her training sessions, she would go through those lists in her head. She would say to herself, “You’re doing it right now! You’re working through your lists!” Yes, Cathy got ill for the actual race. But what she had been able to accomplish in training for this race was far beyond what she thought she could do. Cathy hadn’t originally intended to give the Ironman a second try. But then everything lined up and she decided to go for it again. She trained hard. 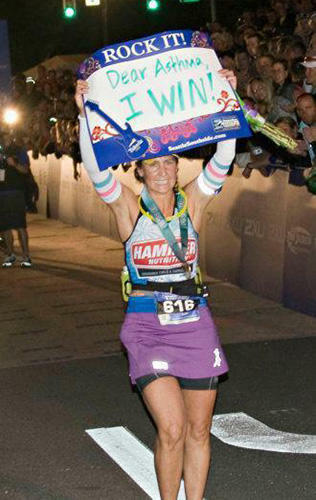 And on June 26, 2012, Cathy completed an Ironman Triathlon in spite of her asthma! Her victory was also a win for the Allergy and Asthma Foundation of America (AAFA). She registered with the Ironman Foundation to fundraise for AAFA. Her efforts raised over $3,700. Cathy knows that she will continue to have episodes of illness all of her life. She cannot always avoid her triggers. But she does do everything she can to stay healthy in between bouts of illness, and always takes her asthma control medications. Plus, surround yourself with people who really understand your illness and will support you. If your goals involve physical exercise, build up slowly. People often say to Cathy, “Your asthma got better because you exercised more.” The reality is, to be able to exercise at all, she had to get healthy enough so she could exercise a little. Then she exercised a little more. Then a little more. Then, in turn, her asthma got a little better, and she was able to exercise a little more. She couldn’t just go out and run a marathon. She had to start with much smaller goals and then build up. What can you accomplish when you #TackleAsthma? Share your story or share your photo of your own win over asthma. Such a great and touching story, and how wonderful of the other participant to offer his medal to you. Thank you for sharing your journey with us. I love your story! Such an inspiration! Makes me want to make more time for cycling...like I know I should! Cathy! You're an inspiration to us all!